If a visitor hopes to experience the Sahara Desert on a 4×4 tour there are two destinations available: Erg Chigaga Dunes and the Erg Chebbi Dunes. The Erg Chigaga is located in the Souss-Massa-Draa area and is about 100 km south of the town of Zagora. Erg Chigaga prides itself on being less frequented and more remote than its counterpart. To arrive in Erg Chigaga from Marrakech you must travel to Ouarzazette (estimated 3 hour journey) and then south to Erg Chgaga. The tarmac will stop in M’Hamid where your Saharan expedition could potentially begin. Erg Chebbi is located abouy 60 km south of the town of Erfoud. Although Erg Chebbi is known for being more of a tourist destination than its counterpart, it is possible to find remote areas of the dunes. There is a bus that goes directly from Marrakech to Merzouga (its closest tourist enter) which can account for bringing many tourists right to the foot of the dunes. To arrive at Erg Chebbi from Marrakech you must first drive to Ouarzette (the same trek if you were going to Erg Chigaga) and then travel East. The tarmac will stop in Merzouga, from there you will be able to walk the dunes, camel trek, or 4×4 as you like. Note: The travel time from Marrakech to each Dunes is roughly the same. 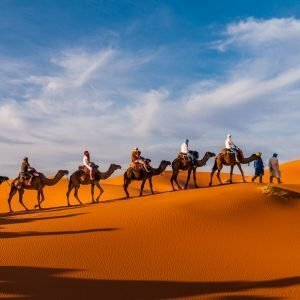 HOWEVER, if you would like to take the tour of The Imperial Cities in Morocco, the dunes of Erg Chebbi are geographically easier to implement in to the itinerary.